Motherwell fans have been spoiled in recent days as the team falls under the media spotlight ahead of the cup final. 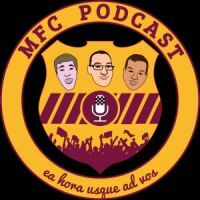 For a more considered insight into the club the ever informative MFC Podcast has published a 40 minute chat with Stephen Robinson. Andy Ross made the best of the opportunity to record an interview with the manager for the podcast – online at mfc1886.com. Robinson needed only occasional prompts as he recalled the journey that started as assistant with Ian Baraclough and now has him preparing to lead the team out at Hampden for a second time this season. The impression came over of a man relaxed yet thoroughly prepared. He is confident that his team will show no fear of the big occasion; that they are confident of the job they face. Much of his comfort stems from the trust he has in his coaching staff and the forward looking attitude that flows through the club. The players have completed their involvement with the press and, as normal a four day preparation for a Saturday match is now underway. The podcast presents a rounded view of the manager and gives us a glimpse of the man who followed Baraclough and McGhee into the hot seat. His experience with Northern Ireland at the Euros and at Oldham has shaped him and he will ensure that we give it our best shot on Saturday.